Is Your Dog Not Eating? FCVC knows it can be disconcerting when your dog does not want to eat. This article from our friends at PetsWebMD.com pinpoints some of the possible causes and solutions to try before the last resort of going to the vet. Whether you’ve had pet dogs for years or you’ve just adopted your first puppy, it can be very distressing when your dog won’t eat. There are a variety of reasons for loss of appetite in dogs. It’s important to determine the cause in order to design the best treatment plan. The first thing to keep in mind is how you’re judging your dog’s appetite. If you’re concerned because your dog isn’t eating as much as the guidelines state on the food you purchase, remember that these are only averages. Many perfectly healthy dogs eat only 60% to 70% of the amount stated on the packaging. When a dog won’t eat, it is referred to as anorexia. This is different from anorexia nervosa, an eating disorder found in humans. Instead anorexia describes a complete loss of appetite in dogs. Because loss of appetite in dogs can indicate illness, it is important to seek veterinary care if you notice changes in your dog’s eating habits. It is especially important to respond promptly to a refusal to eat in dogs that usually eat well. Even though most dogs can go a couple of days without food having without significant bad effects, it is best to address the problem as early as possible. Illness. A decreased appetite in dogs is often a sign of sickness, especially if your dog is exhibiting other symptoms at the same time. 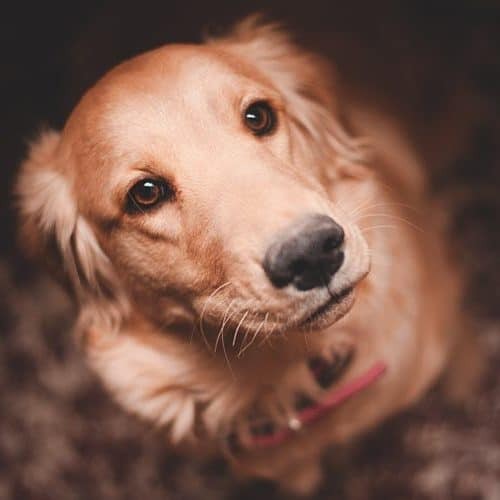 Although a loss of appetite in dogs doesn’t necessarily indicate serious disease, prompt veterinary attention is important because it could be a sign of significant illness, including cancer, various systemic infections, pain, liver problems, and kidney failure. Dental disease. Your dog may not want to eat because something in their mouth is causing pain. Have him checked for a broken or loose tooth, severe gingivitis and even an oral tumor. Recent vaccination. Fortunately, vaccinations are available for many serious and contagious dog diseases. Although these injections have saved the lives of millions of pets in the past 100 years, they do sometimes have adverse effects. The majority of these are minor and brief, including a temporary loss of appetite in dogs. Travel and unfamiliar surroundings. If your dog’s appetite was fine until you went on a trip with him or moved to a new location, it may be that your dog won’t eat because of traveling or the unfamiliar surroundings. Some animals may get motion sickness, and others become nervous or uncomfortable in new places. Pickiness or behavior issues. Some dogs are just picky, or their refusal to eat may be caused by feeding them in situations where they aren’t comfortable, such as around an aggressive dog or from a bowl at an uncomfortable height. Because a decreased appetite in dogs may be caused by illness, never assume that your dog is picky without investigating other possibilities first. What you can do to help when your dog won’t eat will depend on what you and your veterinarian determine to be the cause of the problem. If your dog’s loss of appetite is caused by illness, the vet may recommend a prescription diet to meet your pet’s nutritional needs while the underlying disease is being addressed. Sometimes these diets are not particularly tasty, especially if your dog is used to regular treats or people food. If your dog is already ill, never starve your pet in an attempt to force it to eat the prescribed diet. Instead, talk with your veterinarian about alternatives. In more severe cases, your vet may prescribe appetite-stimulating medications, recommend syringe-feeding a liquid diet, or insert a feeding tube. If your dog’s decreased appetite is a behavior problem caused by pickiness or a discomfort with mealtime, rather than the result of a medical condition, there are a number of things you can do to encourage your pet to eat. Feeding your pet on a regular schedule, usually at least twice a day. Making mealtime a fun time for your pet, such as by playing with a toy that dispenses food or rewarding your dog with food for doing a trick. Taking your dog for a walk before mealtime. Trying a different kind of food, such as canned food if you normally feed your dog dry food. At FCVC we do not want your dog to go without eating. So if your canine just refuses to eat, please let us know so we can make some suggestions for your situation. We know this can be a stressful situation for you and your dog. Let us help! We can suggest many different types of dog food, many which are available through our Online Pharmacy, deliverable to your front door.